Recapturing the health and beauty of your smile after a tooth extraction can be easily achieved when choosing dental implants as part of your restorative treatment plan. 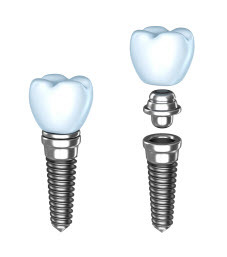 Whether you’ve spent years dealing with the drawbacks of traditional dentures, or you’re looking for a viable option to replace failing teeth, dental implants contribute to full function with impeccable stability. At Adler Dental, Dr. Elaine Adler, Dr. Heather Moed, and our caring staff take pride in transforming patients’ lives by providing aesthetically appealing smiles. If you are interested in learning more about dental implants and live or work near Midtown Manhattan, call to make an appointment today. Extracting a tooth or teeth may be necessary for a variety of reasons, most commonly due to cracks, chips, or advanced decay. Additionally, teeth may need to be removed if the root canal therapy didn’t completely eliminate infection, resulting in tooth failure. After the initial examination, our Manhattan dentists will discuss your options for an appropriate solution. Traditionally, missing teeth have been replaced by bridges, partials, or dentures. While these methods improve uniformity from a cosmetic standpoint, your jaw doesn’t receive stimulation to maintain its health and volume. If you decide to stabilize your restoration by having dental implants placed, we collaborate with a specialist to streamline the treatment process. This trusted local surgeon performs the extraction, when necessary, and places the implant. Regardless of how you lost the teeth, there are plenty of restorative options for filling the empty space. Incorporating dental implants into the treatment plan, however, provides the best opportunity to rebuild the strength and integrity of the jaw bone. During the healing process, the titanium post fuses to the bone, creating a stable base in which to secure the restoration. Once tissues have healed, you are ready for the implant-supported prosthetic. Before the surgeon handles your extraction and implant placement, we start the preparation process for manufacturing your restoration. Dr. Adler and Dr. Moed utilize our office’s state-of-the-art digital impression technology to provide to our local lab for manufacturing your restoration. Once your new tooth or teeth is manufactured to your precise specifications, Dr. Adler and Dr. Moed affix your restoration to the implant. Following the completion of the treatment plan, our team at Adler Dental will handle the continued maintenance of your restored teeth. For nearly 20 years, our team at Adler Dental has provided quality dental implants in Manhattan, particularly around Madison Avenue and the Flatiron District. If you are looking for a practice that seamlessly blends compassion and professionalism, call to set up an appointment today!